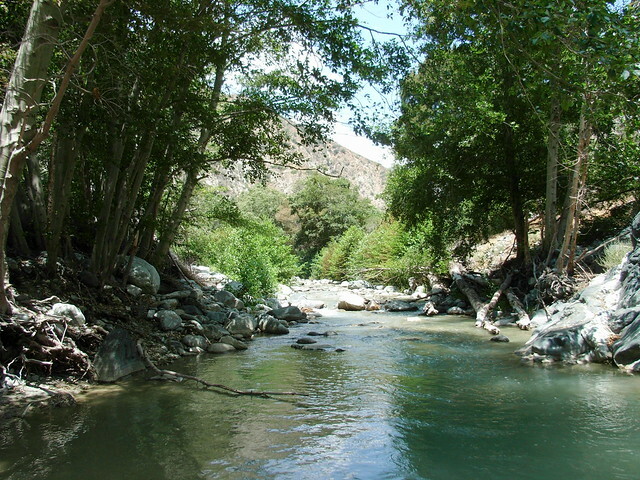 A 10 mile trek down the East Fork of the San Gabriel River, following the path of an attempted highway. This hike features multiple river crossings, plenty of opportunities to swim, historic sections of visible roads and tunnels, and the Bridge to Nowhere — a 120 foot high concrete bridge in the middle of the canyon. 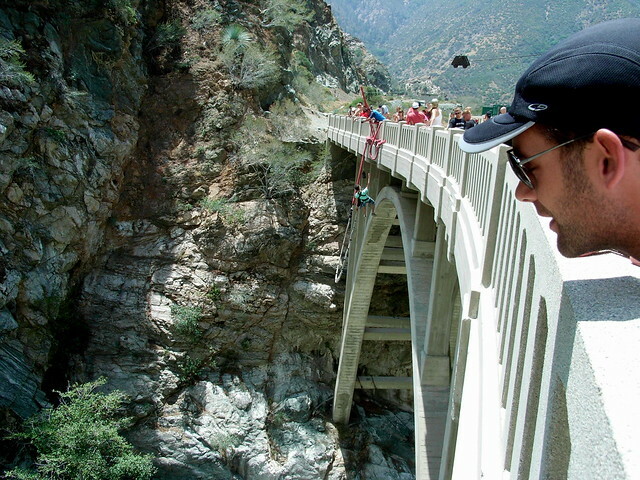 The bridge is an odd and beautiful sight that is unparalleled in the San Gabriels — and it’s also the only place in California were bungee jumping is allowed (on weekends). Note: You will need a free Wilderness Permit to hike inside the Sheep Mountain Wilderness. You can obtain one at any manned ranger station or visitor center in the Angeles National Forest / San Gabriel Mountains National Monument or at a self-service registry at the trailhead. A few notes on this trail before you decide to venture here. First, although you can hike this year-round, there are different precautions you should take depending on when you want to hike here. During the cooler winter months, expect water levels to be significantly higher and crossings to be more difficult. Also, if there is even a slight chance of a storm coming through the area, we recommend postponing your trip. This canyon has a long and storied history of deadly and destructive flash floods and you do not want to be here when that water comes barreling down this narrow canyon. If you hike in the warmer months, carry LOTS of drinking water and be sure you stop to eat snacks along the way. There is almost no shade and the trail – with its numerous boulder hops and crossings – is deceptively exhausting. OK, now let’s get to the good stuff! 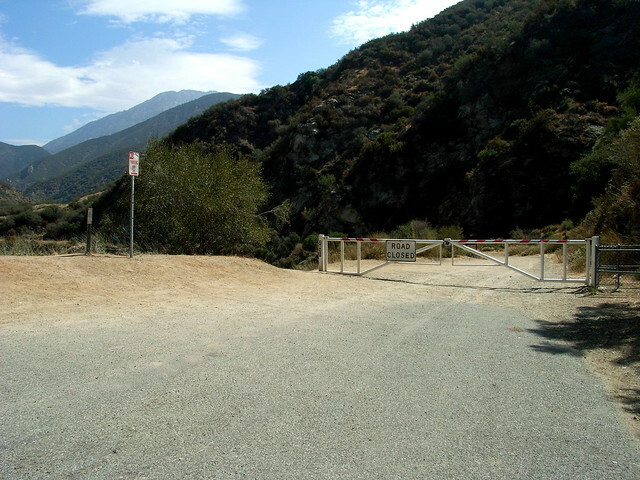 The trail starts at Coyote Flat at a locked gate at the end of East Fork Road (or USFS 8W16). There is a small parking lot at the end of the road, but by the time we’d reached the trailhead, cars were already overflowing onto the rest of the road. 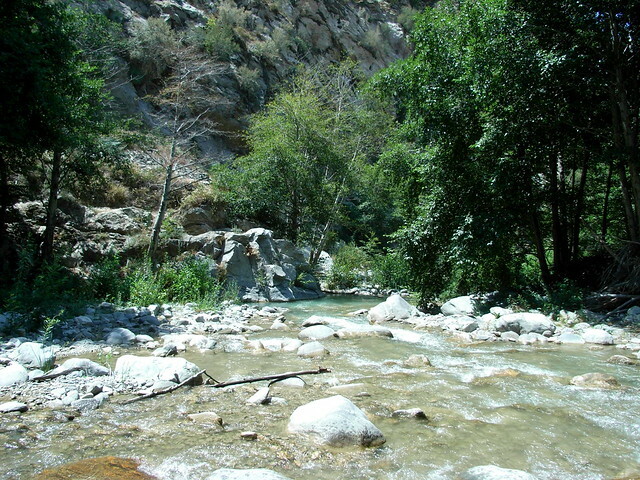 The area is a very popular swimming and picnicking destination, and on hot days you’ll often see tents and swimmers lined up along the entire river on the way in. Most of these bathers rarely venture a few hundred feet from their parked cars, however, so don’t let a crowded parking situation deter you from setting foot on the trail. After walking around the gate, the trail descends on a wide dirt road. The road is unremarkable, although it does offer tremendous views of the landscape you’re about to enter. 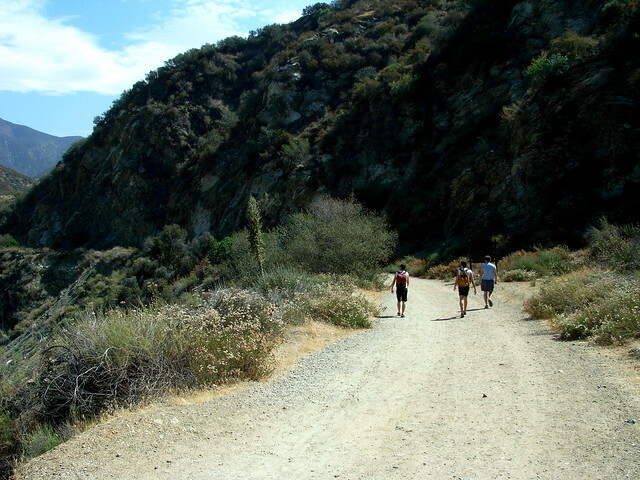 The dirt road ends at the junction with Heaton Flats Trail — the turnoff for the grueling ascent toward Iron Mountain, considered by many to be one of the most difficult day hikes in the San Gabriel Mountains. Skip this trail, hit up the bathroom if you need to, and continue along the road. It quickly narrows and makes a bee-line for the water’s edge. As with many sections on this trail, you can choose to walk in the loose sand of the river’s flood plain, or follow one of many well-worn footpaths on higher ground. Right here, however, either path will shortly force you to a choke point along the water. Depending on the water’s level, you will have to ford through a small section, staying on the east shore, or you can hop over a few boulders like my traveling companions did. Stay on the river’s eastern shore, walking along the boulders as you make your way north. This section of the trail may still be crowded with those slightly-more-adventuresome bathers, who have taken to creating numerous dams near choice swimming holes in the river. At a point where the river makes a slight bend, the trail crosses the river to the western bank and ascends a low rocky ridge, away from the water. The trail stays away from the river for a short distance, cutting a clear path through brush and grass as it follows the river north. The second crossing is just after this brushy area, and on the east bank, the trail splits into several use trails continuing north. There are several different paths, many of them marked with cairns. While there is no “correct” route, they all do go to the same place, so just keep trying to follow the river and watch out for Spanish Bayonets. 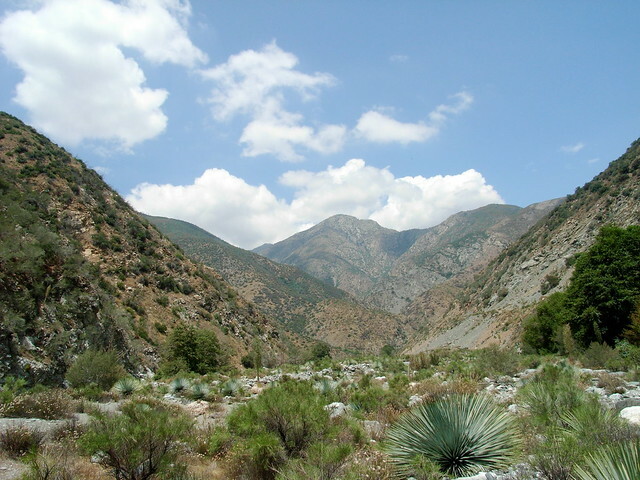 The trail stays to the east of the river at the junction with Shoemaker Canyon, a decidedly sharp curve in the river to the northeast. 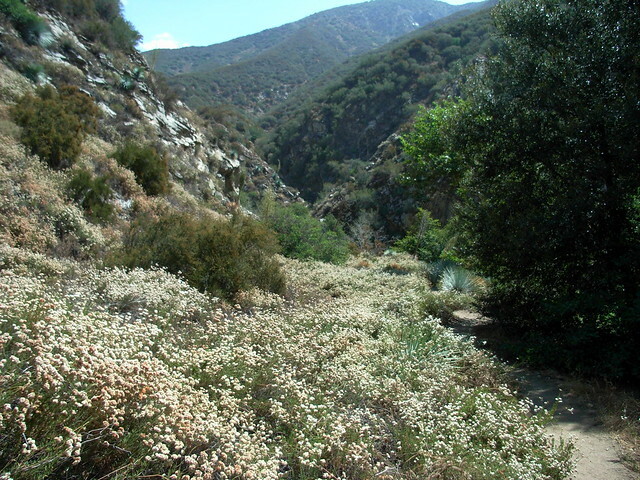 You’ll be able to note this location by looking both down and up — up at the western mountains to see the final tunnel in the abandoned Shoemaker Canyon Road, and down to notice the old overgrown asphalt on the failed San Gabriel River Road. This is what a Southern Californian mountain road looks like after almost 70 years of disuse. The trail turns toward the northeast and crosses the river twice. By now, you should be experiencing some moments of solitude. You might want to stop and enjoy the river for a bit, or just listen to its white noise while you stop for a quick snack. The trail continues east, in the shadow of some high ridges — some of which have a sizable amount of poison oak growing near them, so be aware. When the river reaches Laurel Gulch, it makes a sharp turn toward the north again. The trail follows the river, and passes a sign marking the entrance to the Sheep Mountain Wilderness Area. Here, the trail enters a broad, dry wash in the river (depending on water levels, of course). 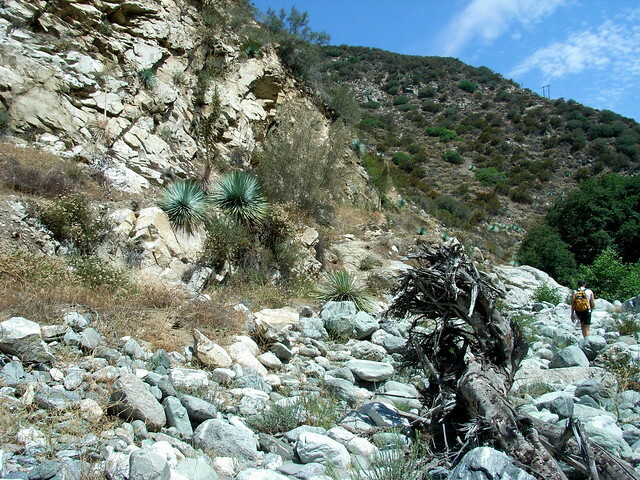 Before the trail leaves the riverbed to make a very short bypass to nearby Allison Gulch, be sure to look at the rock walls to your west. You should be able to make out an unusual ribbon of quartz running through an otherwise dark formation, which is known as Swan Rock. If you reach this point of the hike in the mid-day, you might not be able to see it … but in indirect sunlight it’s very apparent. Allison Gulch is the turn off for another approach to Iron Mountain via an unmaintained trail that passes the ruins of Allison Mine, one of the many not-very-successful former mining ventures in this region. Cross the river twice again just north of Allison Gulch, enjoying the small shaded areas and deep swimming holes if it’s getting too hot out for ya. Just beyond these two close crossings, the trail leaves the riverside again and meets up with another section of broken-down pavement. This section of the trail follows a very distinct path, which only occasionally winds around troublesome bayonets. Keep following north until it descends back down to a wide, rocky area of riverbed. Here, the river makes a sharp bend to the west as it continues to meander north. 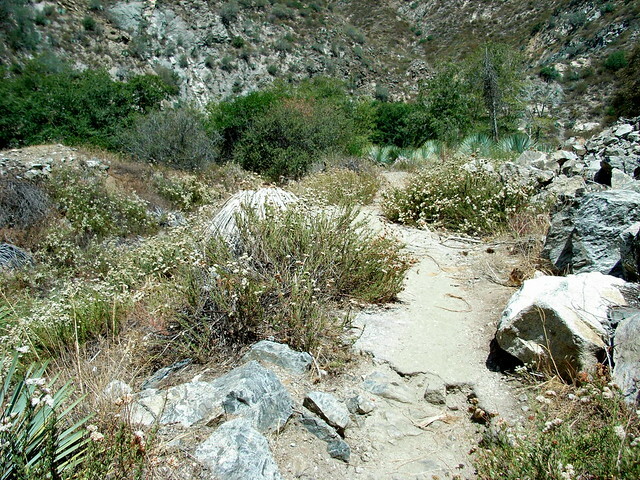 There are several clear, marked trails that leave the riverbed and ascend back up to the old road ridge. IGNORE them and continue along the river. A lower route will appear and continue. Taking the upper routes will get you to the top of a ridge overlooking the river, with an apparent ridge route along what is left of the road grade. This route is possible to travel, but it is unnecessarily dangerous and not recommended. Instead, continue along the lower route near the river, crossing once to a low sandbar-type island in the middle of the river, then once again back to the eastern bank — again, taking time to stop and enjoy your surroundings. After the two crossings, continue northeast, toward the higher road grade. There is a short path that scrambles up on the east side of the canyon to join this route. 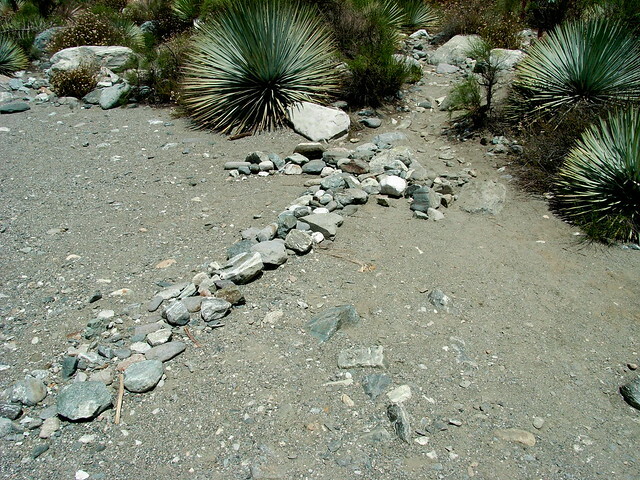 It’s pretty easy to find, even without this creative help left behind by some hikers with too much time on their hands. From here, it’s pretty easy going the rest of the way. Continue gaining elevation through brush as the old road grade gets further above the water. At a bend just before Devil Gulch, the trail hooks northeast and passes a sign marking the boundary of private property. There are a few steep drop-offs near this section, but nothing any moderately cautious hiker shouldn’t be able to handle. Very shortly, you will pass a small metal cabin and get your first glimpse of the Bridge, which doesn’t look all that special when you first approach it. 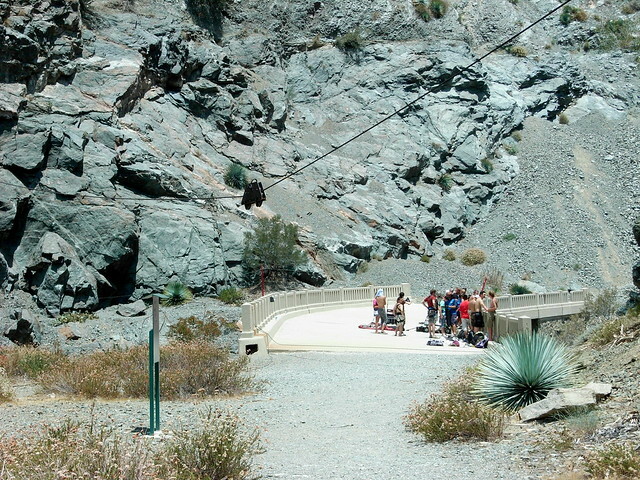 It’s only when you cross the bridge and turn around do you get to see some really striking views — and if you go on the weekend, you might be treated to a large bungee jumping show, too. 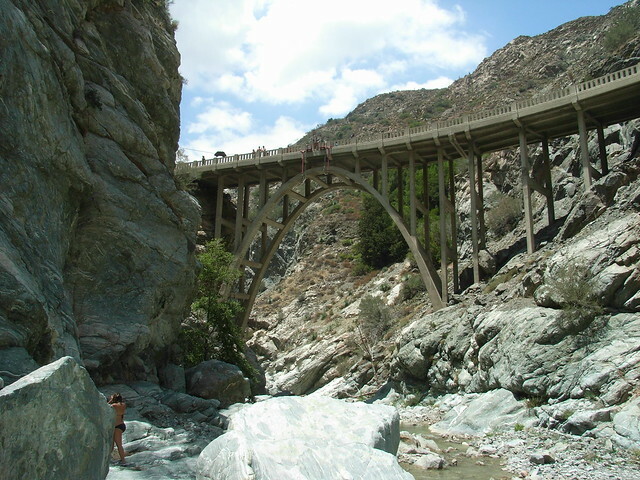 After you’ve had your fill of the sight of the bridge, you have a few options — you can continue on the trail just around the next meander in the canyon to the beginnings of a blasted tunnel, continue even further past that to the Narrows — the deepest gorge in the San Gabriels — or just scramble down a use trail to some exquisite swimming holes with great views of the bridge. We were happy to swim, but I think it may very well be impossible not to have a great time, no matter what you decide to do along this trail. Just remember to leave some energy for the hike out. Although this hike is mostly-flat, I’m always surprised at just how zonked out I am after getting back to my car. Be sure to bring more water than you think you need and take plenty of breaks – even if you don’t think you need them. Very good. Junctions are well marked. While you may get lost when a use-trail splits, or skip a crossing, you're basically just following the water for the majority of the way. You can do this trail year-round but it's best in the summer and fall after a good rainy season. It can be extremely dangerous during the winter due to flash floods. Heaton Flat Campground is just off the trail, near the trailhead. 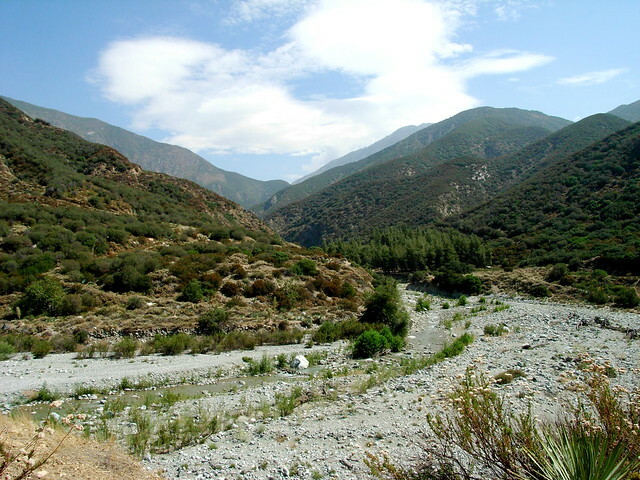 From the Azusa Ave/CA-39 exit off the 210, head north for 11.8 miles, then turn right onto East Fork Road. In 3.3 miles, stay to the right to keep on East Fork Road and in 1.9 miles make a sharp left onto Camp Bonita Road. This road ends at the trailhead. Adventure Pass required. Is a Adventure Pass needed if I stay at the camp ground? Which camp site is the most convenient? Thank you! Great Presentation -- thank you. 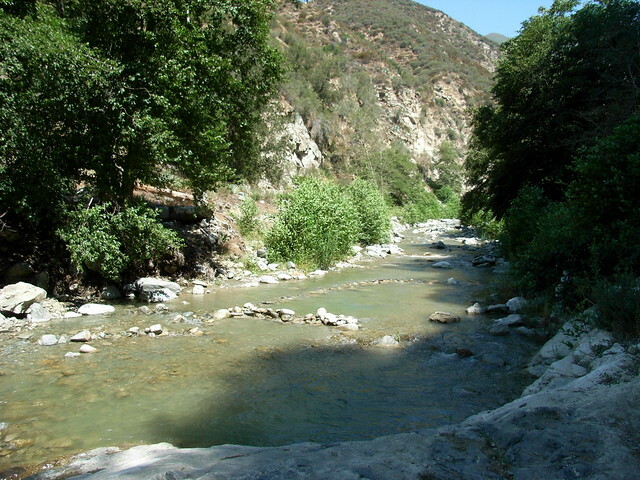 Having fished and gold-panned in the East Fork since the 1950s with my father and hiked and backpacked in the 60s and 70s with friends -- then took my kids and grandkids (OK, maybe not as far...) -- I always appreciate good reviews of the San Gabriels. The Bridge to Nowhere once had a tunnel on the far side -- now dynamited shut. Popularity of the hike seemed to go up after I wrote a magazine article on the bridge back in the early '90s. I completed this hike yesterday (10/22) with 2 dogs. We arrived at the trailhead at 9:40 and made it to the bridge at 12:20. We left the bridge at 1:20 and arrived at our car at 4:00pm. I do want to note that we had to park at the bottom of the hill before the little bridge because they were doing work on the bridge, this added an additional .6 miles to our hike. My husband and I hike very often and this was our first time doing the Bridge to Nowhere. It is a LONG hike, but I do not think that it is incredibly difficult, especially in comparison to the Wisdom Tree. We thought that there was plenty of shade along this hike, not to mention you are next to the river for the majority of the hike, so if you get too hot you can cool off by the water. Our dogs were certainly tired at the end of this, but they did very well. They made great use of the river to cool off and swim. There are about 500 different ways to hike this trail and still make it to the bridge. We ended up coming back a completely different route then we took getting there and still made about the same time. Just enjoy the scenery and sounds! We got a later start on Sunday but it still turned out to be an amazing hike. The swimming by the bridge was a godsend after the heat and it wasn't too crowded either. The water was pretty chilly so it balanced the 90+ degree heat just right. For anyone going, definitely bring a lot of water. Two nalgenes was just barely enough. If you've got a water purification system even better since the whole hike goes along the river. 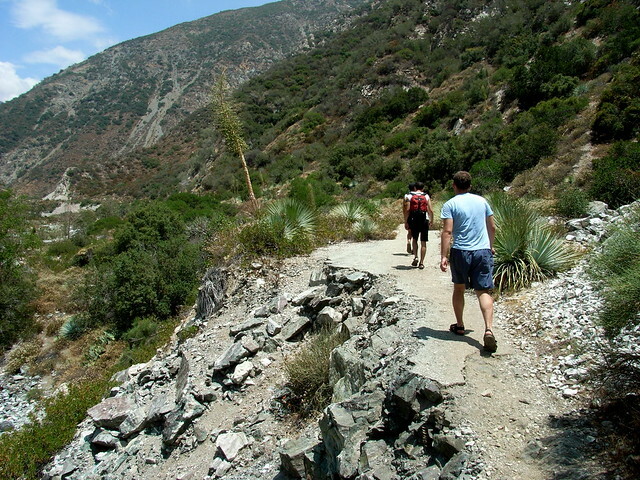 This trail can be done during hot weather, just remember to bring WAY more water than you think you'll need and lather up on sunscreen - and definitely bring some cool clothes and shade items with you. Canyons generally heat up more than their surrounding landscapes, and this one is in full sun for pretty much the entire day. Yes, you'll have access to cooling water for most of the route, but that won't help with dehydration if you're not drinking enough and balancing out with snacks. My recommendation is to wait until the heat wave breaks, but if you are going to, try to get there as early as possible. Not only will you beat some of the bathing crowd, but you'll also have the very welcome help of additional shadows in the early morning light. Have a safe and fun hike! Has anyone done this hike in the last couples weeks? 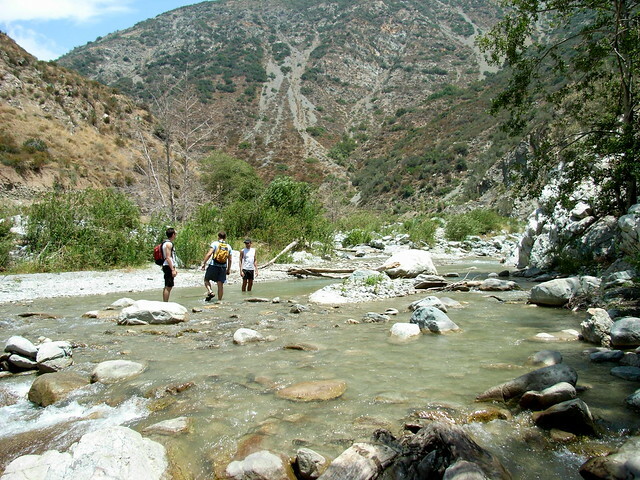 Azusa is in the 100's this weekend so I was concerned with how hot the trail can get or if it's not too bad given that you're hiking along the water for a portion of it (and you bring a whole bunch of your own H20). 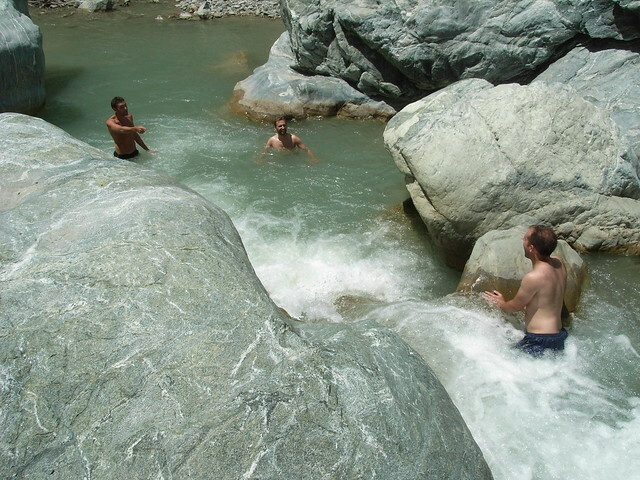 This hike is one of my best adventures..the river pools, the camping and just the adventure it self. Make sure u take plenty of water and snacks or u will be hangry...lol. I've been doing this hike every year for about 5 years. 1st time took me the longest 9hrs.. now got it down to 4 hours. Summer is the best time:) Have fun! Eep! Sorry to hear about this and glad some of the other hikers were around to help out! This Trail needs help! I have been hiking this trail for years but in several places it has become Dangerous. On Friday July 21st 2018, I was hit by rock fall out of nowhere at about 2 or 2,5 miles in. I was on the main trail. One of the rocks hit me in the ankle, there was blood everywhere. The rock also broke my Tibia in my left leg. Thanks to the kindness of strangers I did not bleed to death and was able to make it out. Maybe there is nothing that can be done and this was just a freak accident. But I believe it could happen again with no warning. I believe the trail needs some help in several places to make it safer. With dogs, please do keep in mind the heat, the length of the trail, and the fact that they'll be walking on hot, sharp rocks for much of the route. Pups routinely get airlifted out of here after they burn their pads - and I had to carry my pitbull out on my shoulders when she got too tired (and she's done long hikes with me before!). As for kids, if your kids can do 10 miles with lots of river crossings in full sun, then go for it - but we rate this trail as difficult. It still wipes me out for a day every time I do it on a hot summer morning!